This is one of the cultivated Japanese mushrooms that become popular in Thai kitchen a couple years ago. One of the reasons is the healthiness of the mushroom itself and the other is the taste that is similar to our beloved Hed-Pluag or termite mushroom. 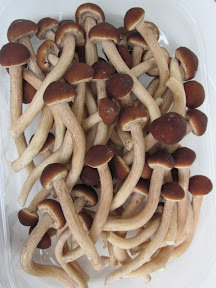 But because they are cultivated, we could get this Yanagi all year round, where as termite mushroom grows in the wild and we can get them only beginning of rainy season and the other type end of rainy season. Mushroom is popular for their healthy meat, wonderful taste and for their good diet among people who need to control their cholesterol. Mushrooms will be particularly more expensive in the vegetarian festival ( เทศกาลกินเจ) There are some company in Thailand that cultivate this mushroom for export, either fresh or canned. The big demand seems to come from China.